Become a Packeter to make the web safer. Get rewarded for protecting the privacy of yourself and others. PacketStream routes your computer's traffic through others users in the PacketStream network. PacketStream's network routing system prevents big data companies from tracking your IP address as you browse the web. Packeters are compensated for participating in the network. 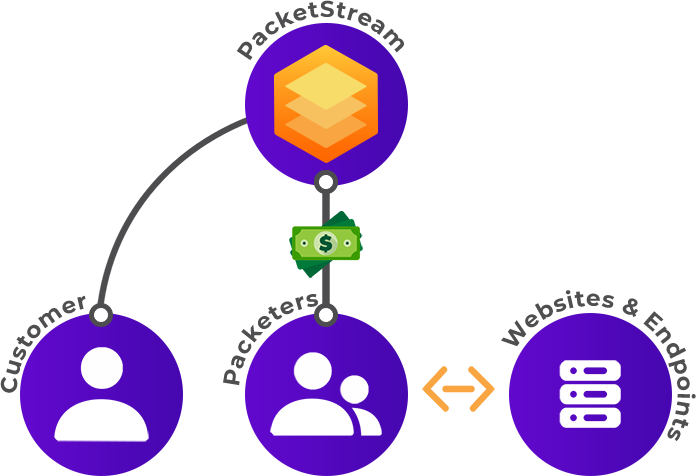 The PacketStream service measures the amount of bandwidth shared and credits your account accordingly. Protect your privacy from digital snoopers. PacketStream rotates your IP address as you browse the web to help prevent big data companies collect personal information for profit. Choose your exit IP's geolocation and gain the benefits of viewing region-locked content from any location. Unlike TOR and traditional VPN/Proxy services, PacketStream's exit IPs come from residential broadband customers which means sites won't block or redirect your traffic for abnormal browsing behavior. Anonymously view landing pages from residential IPs without being cloaked to ensure they don't contain malware or improper advertising. Learn how competitors algorithmically price their offerings to users in different regions and locations. Monitor the web for improper user of intellectual property and trademarks and see exactly what a normal user would see from his/her home connection. Test your web & mobile properties from around the world to ensure content is being delivered accurately and quickly to your global userbase.